This section is for my wife who loves Barbies. If you like Barbies too write linda and let her know. Hi, this is Linda. I am a self confessed "Barbie Nut", at least according to my husband. I started collecting Barbies four years ago when I got rid of my exhusband and found one who was Barbie friendly. I highly recommend Barbie friendly husbands, they are just so.....Barbie friendly. In reality my ex would or did not take my love for Barbie to heart. When I married my second husband I told him of my love and my ex's lack of Barbie support. That was almost four years and 27 collector Barbies ago. 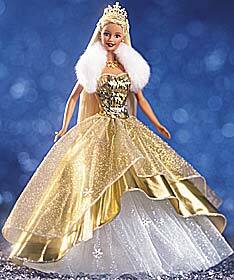 I will put pictures of my favorite Barbies in the days to come or when ever I can get the chance to take the pictures. My goal for this page is to share my Barbie World and look for others with similar interest. Pictures and other Barbie links will be here soon.